Our American made hour and minute hands are sold in pre-matched pairs. All you need to be concerned with is the length of the minute hand. 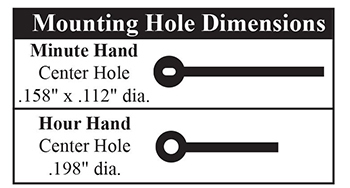 Minute hands are measured from the center of the mounting hole to the tip of the hand. Normally, minute hands and second hands are about the same length. Please remember that all of our hands can be easily trimmed to a shorter length, and that they have been made to fit most battery operated quartz movements. You may also be interested in our Sweep Second Hands selection.